Who can’t use a little pick me up now and then? If like the rest of us you’ve been saving those pennies, now is the time to indulge a little. I’ve found some terrific items that lean towards more of the “couture” rather than “crap” price points and everything I’ve singled out offers great value for money. My choices run the seasonal gamut, from summer right through holiday. Happy shopping. Now that Henri Bendel’s focus is strictly on accessories be sure to check out their latest find - Tuccia DiCapri’s gorgeous custom made sandals. What makes this line interesting is the fact that customers can practically design their own sandals, by style, color and heel height, and they’ll be ready in 30 minutes! The company’s founders traveled to Capri to study the ancient art under one of Italy’s foremost families of shoemakers. While the prices are pretty steep (they range from $168 - $408) just sliding you feet into one of these beautifully crafted sandals will take you back to those golden days spent on Capri, St. Tropez or St. Barts…now all you need is a yacht. The collection will be available until September so if you’ve got the creative urge, this is your chance. Bendel’s biz has been pretty brisk. For more info, go to www.tucciadicapri.com. Now this tiny Upper East Side boutique at 1324 Lexington Avenue came as quite a surprise. I spotted some of the most unique vintage bakelite and designer jewelry items at Ms. Montage. While the shop also offers a well edited RTW selection, it’s the unique bracelets that should have you running uptown. While prices can run into the hundreds for truly special pieces, there are some very affordable ones as well. Personally, I’m a huge fan of Italian costume jewelry designer Angela Caputi’s entire collection. For more info on what’s new and noteworthy, call the boutique’s helpful staff at 212 722-1077 or email tessonlex@hotmail.com. Continuing in its quest to help find a cure for breast cancer, Bloomingdale’s has put together a showcase for Breast Cancer Awareness Month in October. There will be special events, new vendors and special custom publications held in-store. 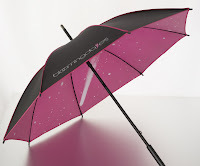 I recently had a first hand peek at some of the terrific merchandise that will be offered and I’d have to give thumbs up to the full size umbrella that’s a steal at $12. It has a chic, black exterior piped in pink and a pretty pink solar system design on the inside by noted illustrator, Marisa Acocella Marchetto. Twenty bucks will get you a chicly (what else?) designed pink pony water bottle from Ralph Laure. It’s exclusive to Bloomies and features single wall stainless steel construction, a screw top lid and a carabiner for portability. It can hold 24 oz. of fancy-schmancy designer water or good old NY tap. One of the most fabulous items I noted during the store’s holiday press preview, was Nespresso’s sleek and compact coffee maker, the C110. It was conceived to appeal to both coffee brewing neophytes and lovers of retro-modern design. It’s available in steel gray and fabulous fire engine red. For a couple of hundred bucks you can enjoy the perfect cup of espresso any time you want! Remember, the holiday stuff won’t be available for a couple of months so just be patient. To shop online, visit www.bloomingdales.com. Roberta Roller Rabbit by Roberta Freymann just happens to be one of the cutest (and chicest in a low key, sort of way) boutiques on the Upper East Side of Manhattan. There are also satellite stores in East Hampton, South Hampton and Brentwood, California. They carry a full range of products for the home, as well as apparel and accessories in unique prints, textures and colors (think a combination of Kate Hudson meets Talitha Getty as the ideal customer). As Ms. Freymann puts it, “our stores are a global shopping destination.” While I’d be perfectly happy to indulge in anything on offer for summer, it’s the holiday stuff that had me drooling, especially the olive “Lakme Kurta” (that’s tunic to you) for $295. This little number worn over skinny pants will take you anywhere all season long for years to come as will the python box clutch for a measly $95. Last but by no means least are Roberta’s GORGEOUS chunky jeweled necklaces. Forget Prada, these are a hell of a lot better looking at a fraction of the price. Personally I’d happily kill for the “Tamika.” It’s worth every penny of the $300 price tag. If you want to make your friends green with envy, this is the one to buy. Check out the company’s new website, www.RobertaRollerRabbit.com. By the way, Roberta Roller rabbit is a famous Indian fairy tale. Who knew? By now you’ve gathered that I’m a big fan of the “new” Ann Taylor so it won’t come as much of a surprise that I also loved their holiday collection. While I’m not going to go on and on about the whole line I definitely think you should invest $185 in a bright red “Glam Puffer Coat.” It’s really more of a ¾ topper with stand up neckline and chic styling that will easily segue from day to night, it’s that versatile. If you really must consider buying someone else a gift, go for the chunky cabled hand knit cardigan in gray, unexpectedly detailed with a row of delicate crystal buttons – or keep it for yourself. It’s gonna be $185 so you might want to re-think the whole gift business! Ann Taylor has stores all over so just keep checking their website for updates. That’s all for now, more Holiday news coming up, Happy shopping, C&C.